For the event we have a parabola in relief (E), broken off to indicate its limitless extension. The disk (Oh) symbolizes the human object; the disk (Oa) represent the animal object. The label (L) represents the higher abstraction called a name (with its meaning given by a definition). In the diagram, we indicate this by a parabola (E), which is supposed to extend indefinitely, which extension we indicate by a broken off line (B). We symbolize the characteristics by small circles (C), the number of which is obviously indefinitely great. 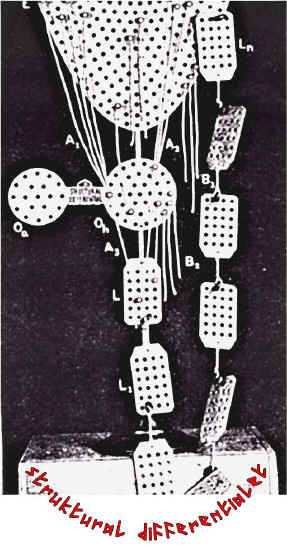 The lines (An) in the relief diagram are hanging strings which are tied to pegs. They indicate the process of abstracting. The free hanging strings (Bn) indicate the most important characteristics left out, neglected, or forgotten in the abstracting. Underneath, we symbolize the 'object' by the circle (O), which has a finite size. The characteristics of the object we also denote by similar little circles (C'). The number of characteristics which an object has is large but finite, and is denoted by the finite number of the small circles (C'). Then we attach a label to the object, its name, let us say 'pencil', which we indicate in our diagram by the label (L). We ascribe, also, characteristics to the labels, and we indicate these characteristics by the little circles (C''). The number of characteristics which we ascribe by definition to the label is still smaller than the number of characteristics the object has. If we were to define an object, we should have to say that an object represents a first abstraction with the finite number of m.o. characteristics an event has. - We must consider the object as a 'first abstraction' (with a finite number of characteristics) from the infinite numbers of characteristics an event has. if we call the level (L) an abstraction of second order, we must call an abstraction from this abstraction an abstraction of third order (L1), Once an abstraction of third order has been produced, it becomes, in turn, a fact on record ... and a statement made about it ... becomes an abstraction of the fourth order (L2). ... by showing the abstracting from the event to the object, and the applying of a name to the object. ... by illustrating the level of statements which can be made about statements. Obviously, if our inspection of the object is through the lower nervous centres, the number of characteristics which the object has is larger (taste, smell ... of our pencil) than the number of characteristics which we ascribe to the label. The label, the importance of which lies in its meanings to us, represents a still higher abstraction from the event, and usually labels, also, a semantic reaction. and that a statement about a statement is not the 'same' statement, nor on one level. The objective level is not words, and cannot be reached by words alone. We must point our finger and be silent, or we shall never reach this level. Our personal feelings, also, are not words, and belong to the objective level. Here is found the fundamental mechanism of the 'time-binding' power which characterizes man, and which allows him, in principle, to gather the experiences of all past generations. ... Among 'humans' the abstraction of high orders produced by others, as well as those produced by oneself, are stimuli to abstracting in still higher orders. In this consciousness of abstracting, we find a most important 'vertical difference' between Smith and Fido. The difference is sharp again. The present theory can only be fully beneficial when the reader acquires in his system the habitual feeling of both the vertical and the horizontal stratifications with which identification becomes impossible. This process has no definite limits, for, whenever statements of any order are made, we can always make a statement about them, and so produce an abstraction of still higher order. This capacity is practically universal among organisms which we call 'humans'. Here we reach a fundamental difference between 'Smith' and 'Fido'. Fido's power of abstracting stops somewhere, although it may include a few orders. Not so with 'Smith', his power of abstracting has no known limit. This sharp difference between 'man' and 'animal' may be called the 'horizontal difference'. which necessitates the differentiation of orders and abstractions.